This morning’s Job Openings and Labor Turnover Survey (JOLTS) report has both some optimistic news about the economy and some rather disappointing news (and revisions to the entire historical series). I’m optimistic because job openings increased in January, rising from 5.3 million to 5.5 million between December 2015 and January 2016. And, the rate of job openings—the number of job openings as a share of total employment and job openings—increased from 3.6 to 3.7. Over the last year the rate of job openings has risen from 3.4 to 3.7—a sign of an economy that continues to recover. But, what we need is for those job openings to translate into hires. Unfortunately, in January, the hires rate dipped, falling from 3.8 to 3.5 in one month. I wouldn’t put much stock in any one month’s fluctuations as the series are quite volatile, however, such a substantial drop in the hires rate is not an indication of positive movement in the labor market. While there has been clear progress in terms of growing job openings, it is also important to remember that a job opening when the labor market is weak often does not mean the same thing as a job opening when the labor market is strong. There is a wide range of “recruitment intensity” a company can put behind a job opening. If a firm is trying hard to fill an opening, it may increase the compensation package and/or scale back the required qualifications. On the other hand, if it is not trying very hard, it might hike up the required qualifications and/or offer a meager compensation package. Perhaps unsurprisingly, research shows that recruitment intensity is cyclical—it tends to be stronger when the labor market is strong, and weaker when the labor market is weak. This means that when a job opening goes unfilled and the labor market is far from full employment, as it is today, companies may very well be holding out for an overly-qualified candidate at a cheap price. The graph below shows the trends in hires, quits, and layoff rates. While the downward spike is clear in the hires rates, it’s also clear that the quits rate fell in January. 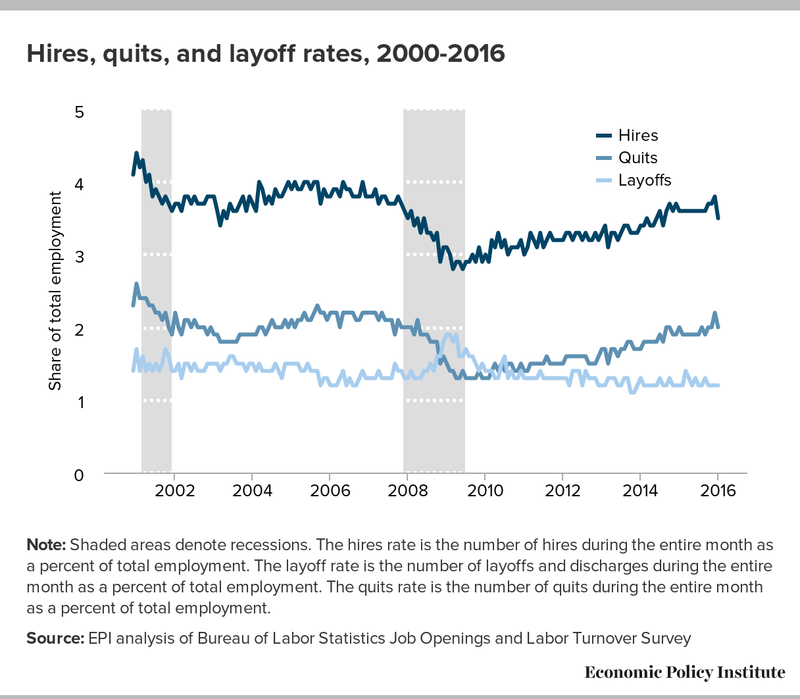 A higher quit rate would indicate an economy where workers feel comfortable quitting their job in search of a better match. As with the hires rate, a drop in the quits rate is disappointing. Hopefully the increase in jobs openings will translate into increasing hires and quits in the coming months.